Rabbi Jacob J. Hecht, o.b.m., my maternal grandfather, once told me the following story: In the times when the Jews lived in the shtetl—long before the New York Lottery came along—there would be a traveling lottery “agent” who would sta­tion himself every week in a different shtetl and sell tickets. In this one particular town everyone bought a ticket. Every­one, that is, besides Shlamazal. You all know what a shlamazal is: someone who has two left hands and two left feet—who can’t do anything right. Shlamazal refused to buy a ticket. After a lot of arm twisting, the shtetl people con­vinced Shlamazal to buy a ticket, and he did. In those days you wrote your own number on the ticket and then you put the ticket in a communal hat. When the ticket was drawn, to everyone’s surprise, the winner was... Shlamazal! The seventh letter of the alef-beis is zayin. Its design is the form of a sword. The top of the zayin is the handle, and the vertical leg is the blade. Another interpretation of the zayin’s design is that it represents a crown and a scepter. The zayin thus alludes to power and authority. The numerical value of the letter zayin is seven. Seven repre­sents the seventh day of the week, which is Shabbos. It is the day G‑d rested. But what does this mean? If G‑d is infinite, why did He have to rest? A human, a mortal, is tired after a hard week at work, so he has to take a breather. But G‑d, the immortal Being? The answer is that the rest is not for G‑d but for us. Since we work for six days a week and appear to be the masters of our fate, we can easily come to believe that we are the ones who have the power to determine our success. Therefore G‑d instructs, “On the seventh day you are to stop. You are to examine the world around you and understand that everything comes from Me.” Shabbos is the day to focus on the Creator of the universe. We also find that many of the foods we eat on Shabbos are connected to the number seven. After shul on Friday night and Shabbos day, Kiddush is made on wine.The Hebrew word for wine is yayin, spelled יין, yud-yud-nun. If one adds up the gematria of יין, it equals 70, or 7.1 After Kiddush, everyone then washes and returns to the table to say the blessing on and eat challah—bread. The gematria of חלה, challah, is 43, and2 4 and 3=7. After they eat the challah, of course they have gefilte fish. The word “fish,” דג (dag), is spelled dalet=4 and gimmel=3, equaling 7. After the gefilte fish they move on to the soup, which is מרק (merak): mem=40, reish=200, kuf=100. Together they equal 340, and 3 and 4=7. After the soup, they proceed to the meat. Meat is בשר (basar): beis=2, shin=300, reish=200, equaling 502—again seven. All of the foods are a delicious reminder that we are partaking of the seventh day, the holy Sabbath. As we are currently in the year 5763 from Creation,4 we are now in the Sixth Millennium. To figure out what “time” we’re inhabiting in that millennium, we need to make some calcula­tions: One thousand years represents one day, or 24 hours of creation. One thousand divided by 24 is 41.67 years per univer­sal hour. If we then divide 41.67 into 763 (the years left after removing the root 5,000, signifying the Sixth Millennium) we get 18.29. We are thus currently 18.29 hours (approximately 18 hours and 17 minutes) past the preceding sunset, and are in “Friday afternoon,” at the cusp of Shabbos. We are living right on the edge of the Seventh Millennium, the eternal Shabbos, the “day” of eternal tranquility. And when do we begin pre­paring in earnest for Shabbos as well as for Mashiach’s arrival? Whether by the clock or calendar, it’s Friday at noon (12:00 noon/the year 5750)!5 Preparation for this era is not something we can scramble for at the very last minute. It is something we must build toward with intention and joy. One of the things the Rebbe instructed us to do in this gen­eration to prepare for Mashiach is to learn the concepts relating to the subject of Mashiach, especially how they are illuminated in the teachings of Chassidus. Although Mashiach will surely come by the year 6,000, the Rebbe tells us that his coming is imminent due to the collective teshuvah and good deeds we have done in the past two thousands years of this last exile. The Alter Rebbe expounded upon the teachings of the Baal Shem Tov in his Tanya7 and other writings, and this philosophy has been transmitted all the way down to the Rebbe, the seventh Rebbe of Chabad Lubavitch. Therefore, it is incumbent upon every Jew who “awaits the coming of Mashiach” to delve into these teachings. One must not wait until he is a master of the entire Talmud before he begins studying these mystical insights. Just as the Shulchan Aruch (the Code of Jewish Law) tells us8 that on Friday afternoon it is customary to take a taste from the foods of Shabbos, so, too, in this generation we should taste from the Shabbos Millennium, where we will be preoccupied with study­ing the secrets of Torah. The way to “taste” this millennium is by studying the teachings of Chassidus and infusing the aura of Mashiach into our everyday activities. The Midrash9 tells us that when G‑d first created the world, G‑dliness was manifest in everyday, physical life. However, seven grave sins caused G‑d to remove Himself seven levels from this world. The first sin was that of Adam in the Garden of Eden. After Adam, there was the sin of Cain, who murdered his brother. Then there was the sin of Enosh, who began to serve idols ... and so on until the seventh sinwhich completed G‑d’s retreat to the farthest heaven. Then came Abraham who reversed the trend. By teaching his generation about the one G‑d, he brought G‑d down from the seventh heaven to the sixth. The righteous acts of his son Isaac brought G‑d down another level to the fifth. Jacob drew G‑d down one more level... until finally, Moses (the seventh leader of Israel) brought G‑d back down to earth, amongst us at Mount Sinai. After receiving the Ten Commandments, the Jewish people sinned with the Golden Calf. G‑d then removed Himself from the present world and ascended back to the first heaven. This cycle of up and down, mitzvos versus sins, holiness versus evil, has repeated itself throughout history. In our current cycle, G‑d’s return to the world began with the Alter Rebbe. The Alter Rebbe brought G‑d down from the seventh to the sixth level. The progression has continued to this current generation, which stands poised for the revelation of Mashiach. The Rebbe has repeatedly told us that our generation is the seventh generation since the Alter Rebbe,10 and thus the generation of Redemption. Just as it was Moses’ generation (the seventh) that left Egypt, so will our generation leave this golus, or exile. One may ask, why are we the ones who are so meritorious? Why is our generation the one that deserves to leave the exile? The answer is this: Shabbos, the holiest day of the week, is on the seventh day. The seventh is beloved by G‑d.11 It is not neces­sarily our individual qualities, but the mere fact that we find ourselves in this era that makes us the last generation of exile and the first generation of Redemption. On Friday afternoon, at the eve of Shabbos, we begin to feel this aura, this special light and inspiration at the cusp of the era of Mashiach. The name zayin means “crown.” There are actually crowns, called zayenin,12 on many of the letters of the alef-beis. The word zayin also means “weapons”—as in the phrase k’lei zayin13 (and as mentioned, the zayin looks like a sword). In addition, zayin means zun, “to sustain.” In essence, these three definitions are interrelated. Shabbos, the crown of Creation, is also the day that blesses and therefore sustains the following week. By observing Shabbos, one accesses these blessings, which then gives us the weapon to overcome all negativity, especially the yetzer hara, the evil inclination. As stated previously, one of the things that tempts us during the work-week is our belief that it is our ability and efforts alone that shape and control our fate. This belief then opens the door to the evil inclination in all its facets. The crown and sword of Shabbos remind us that G‑d and only G‑d is the Master of our fate, and this belief gives us the ability to con­quer all negative forces. Indeed, blessings are our truest, most reliable weapons. The meanings of zayin also parallel the Seventh Millennium. When G‑d created the world, He did not want a world of war and destruction, hate and envy, sickness and death. He could easily have created a perfect world, but desired, rather, that man have the merit of helping Him achieve that state. Knowing this gives us the power to sustain ourselves and bolster our faith during these last moments of exile, and overcome the darkness and difficulty we are experiencing. 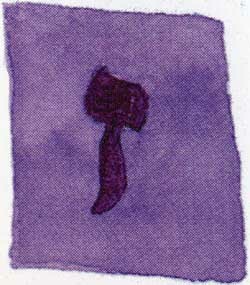 When Mashiach comes, there will no longer be evil upon the earth—as it states: “...and the spirit of impurity will be removed from upon the earth.”14 Believing in Mashiach helps bring about the transformation spoken of by the prophet Isaiah in which: “They shall beat their swords into plowshares and their spears into pruning hooks. Nation shall not lift up sword against nation, neither shall they learn war any more.”15 All of this is contained in the letter zayin. According to the calculation known as mispar katan (the “small count”) in which the zeros are dropped, seventy is considered as seven. The end of Tractate Tamid. Based on the publication date of this book. See Sefer HaSichos 5750, p. 254, 256. In that sicha, the Rebbe also cites a second opinion that brings the year 5750 even closer to the onset of Shabbos. In this calculation, which divides the millennium by the twelve daylight hours (vs. twenty-four hours), the current year corresponds to 3:00 p.m. before Shabbos. A disciple of the holy AriZal, Rabbi Isaac Luria. All the written teachings of the AriZal in our possession today were transmitted by Rabbi Chaim Vital (1543-1620). Rabbi Joseph B. Soloveitchik (1903-1993), head of Yeshiva University, once related, “If not for my Chabad melamed (Chassidic teacher), I would today be lacking in an entire dimension of knowledge... Even today, I still know sections of the Tanya by heart.” From The Rav, by Rabbi Aaron Rakeffet-Rothkoff, vol. 1, p. 147, KTAV Publishing House, Inc., Jersey City, NJ, 1999. Shulchan Aruch of the Alter Rebbe, vol. II, ch. 250:8. See Basi LeGani 5710, ch. 1. Basi LeGani 5711, ch. 3. According to Jewish law, the following seven letters (known by the acronym shatnez getz) must be written with crowns: shin, ayin, tes, nun, zayin, gimmel, tzaddik. .Wd zWbyga. Shulchan Aruch of the Alter Rebbe, vol. I, ch. 36:5.